AirPlay devices typically follow a predictable formula: big sound from a single speaker, wireless audio and costing anywhere from $300 to $600. What if you could get that big sound and wireless audio, using Bluetooth instead of Wi-Fi at the fraction of the price of a typical AirPlay speaker? That’s exactly what the subject of our review is offering for less than $150. 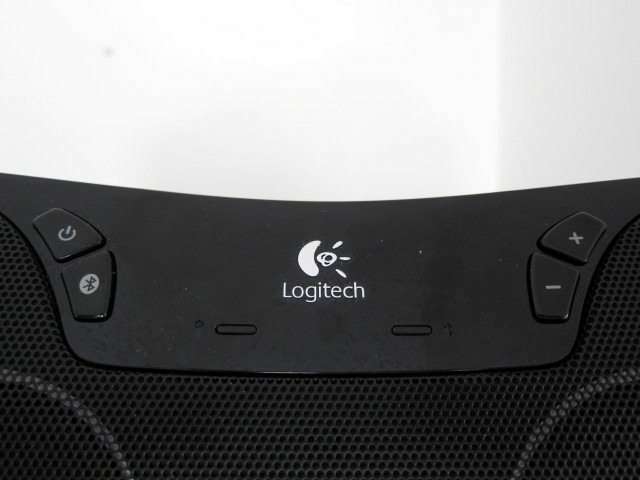 Is the Logitech Wireless Boom box a legitimate alternative to AirPlay speakers? Let’s find out. 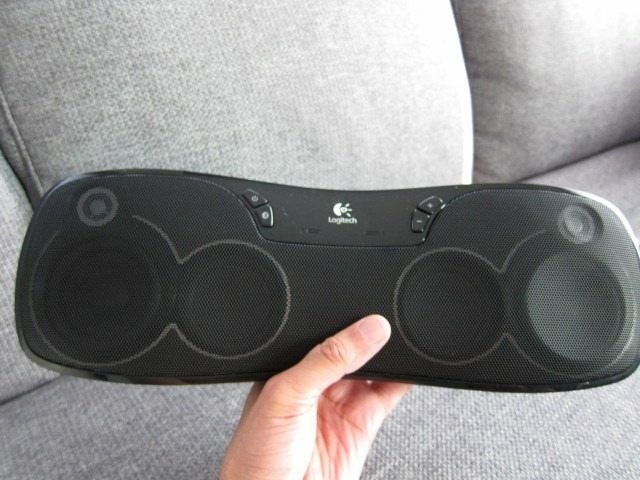 The idea behind the Logitech Wireless Boombox is fairly simple: if you put a rechargeable battery in a speaker and use Bluetooth as the means to connect to various audio sources, you’d have a completely wireless solution, well at least when you’re not charging it. 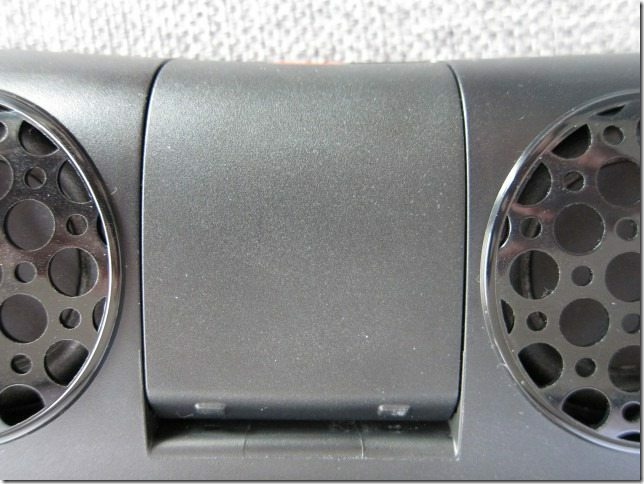 In this case Logitech adds a 3.5 mm auxiliary audio input, uses two fairly large 3” drivers, two ½” tweeters, gives it plenty of power and quite uncommon for this type of setup: not two, but four 2” passive radiators. The result is a portable speaker that can function completely wireless, albeit one that sacrifices portability due to its larger size. But unlike much smaller and more portable speakers, its added size makes room for much larger drivers and a more powerful amp which in turn results in a bigger sound and very impressive performance that blows most portable speakers straight out of the water. The Wireless Boombox is Logitech’s flagship Bluetooth wireless speaker and is a step above both the Wireless Speaker Z515 and the Mini Boombox which we also got a chance to review. Despite the similarity in name, the Wireless Boombox lacks the Mini’s built-in microphone, meaning you’ll have to keep your smartphone close when making calls and the audio is not transferred to the speaker, it’s also much larger and has a lot more power. 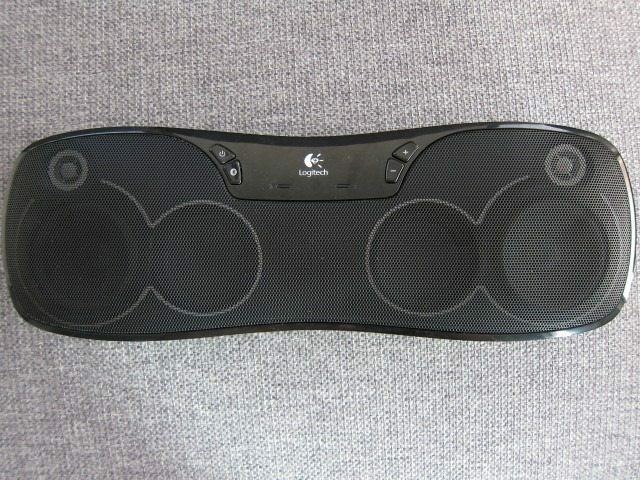 It’s basically a modified version of the Rechargeable Speaker S715i, but lacks the Universal Dock Connector for iPod/iPhone, doesn’t come with the infrared remote control and travel case. In turn it gains Bluetooth connectivity and twice as much power at 10w x 2 (compared to 5wx2 for the S715i). The Wireless Boombox also loses 2 hours of battery life coming in at 6 hours, while the S715i is rated at 8 hours. The loss in battery life is probably the result of more power (twice as much) and the inclusion of Bluetooth, all while using the same battery capacity. 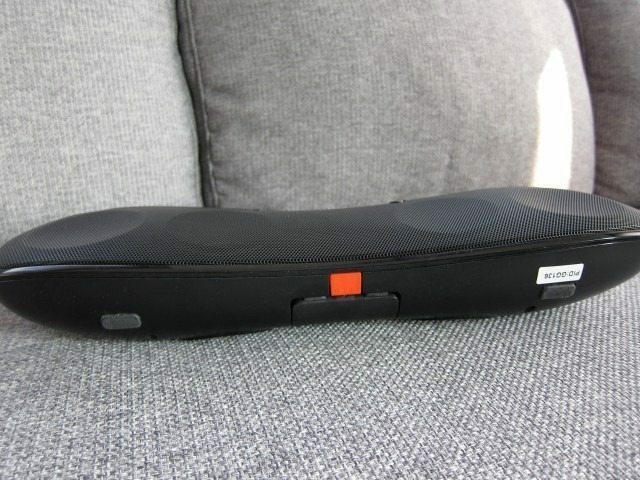 Considering how similar the S715i is to the Wireless Boombox, it’s shame Logitech decided not to include the travel case. One could argue that the Wireless Boombox is even more portable due to the lack of Universal dock, hence it would make sense to include this accessory. And unlike the Mini Boombox, the much larger Boombox can’t be put in a bag or comfortably held in one hand for long periods of time, making a travel case with a handle a necessity. 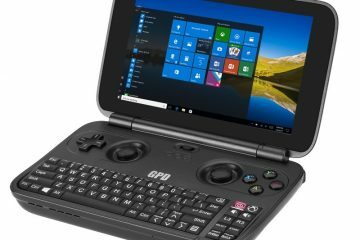 We hope Logitech decides to include this with future versions. 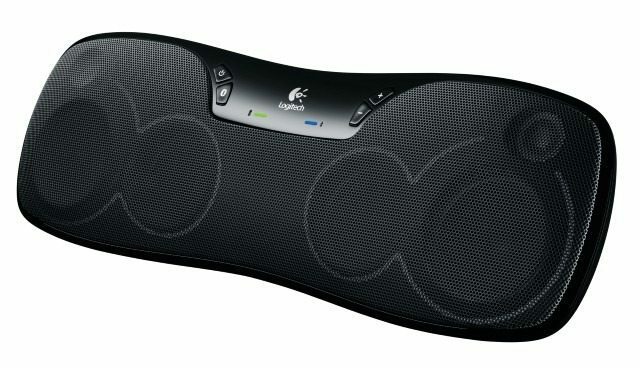 Another derivative of these speaker, Logitech’s AirPlay offering, the UE Air Speaker appears to be a souped-up and larger version of the Wireless Boombox with an Universal Dock Connector, AirPlay, overall better audio performance and more power. It does however appears to be using the same 3″ drivers and tweeters, indicating it’s using many of the same internals, but Logitech seems to have also turbocharged the Air speakers to justify the increase in price, the reason it also gains an extra 10 watts of power. Overall the Wireless Boombox should slightly outperform the S715i. The UE Air Speaker, basically a turbocharged version of the Wireless Boombox with its added watts of power and uncompressed audio should outperform the Boombox, but not by a wide margin. In fact, considering the huge price difference, the Wireless Boombox seems to offer the most bang for the buck, offering performance that’s close to the UE Air and other AirPlay-based speaker, but at the at the fraction of the cost. 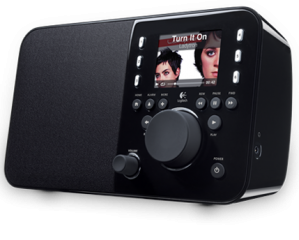 Those considering high-end AirPlay speakers, such as the UE Air, should seriously consider the Wireless Boombox. The included 3.5mm audio cable is a nice touch, something that come with the Mini Boombox. The power supply is on the large size, but it does the job just fine and most importantly the 6-foot cable should be more than enough. We don’t consider the omission of the IR-remote (Which is included with the S715i) a problem, since in the case of the Wireless Boombox, your smartphone or tablet functions as the remote and controls both the audio and volume. But like we’ve mentioned before the travel case should have been included, especially for a speaker that’s pushing the limits of what can be called portable. 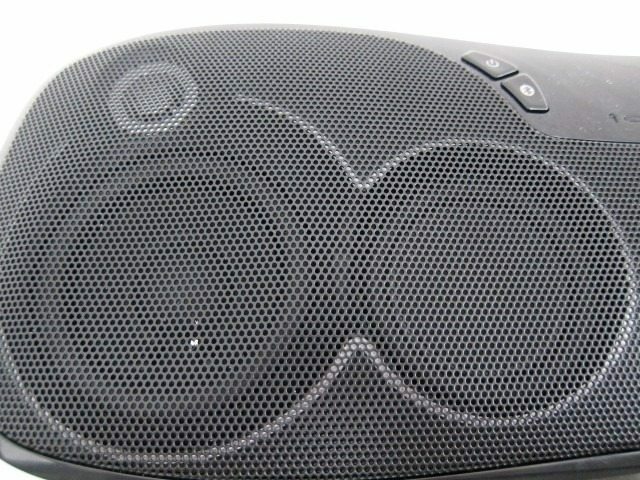 The Wireless Boombox’s design is best described as peanut-shape (or giant bow tie), Black and relatively thin for a speaker. 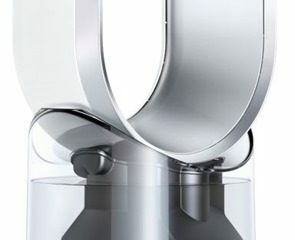 In fact due to its thin design and the placement of the pop-out stand, it gives the illusion of doing the gravity-defying feat of being able to stand slightly angled without falling over. Just like a peanut it’s also slightly thinner near the center and gets thicker as you move outwards to accommodate the drivers. Despite being significantly larger than the Mini Boombox, it isn’t any thicker than its tiny sibling. In fact it’s only when you realize that there’s a battery, tweeters, two 3” drivers and four 2” passive radiators all crammed into a fairly small space, you start to appreciate just how thin this speaker really is. I like the overall design: modern, understated due to its all-Black design and except for one single straight line, it’s all about flowing lines and curves, giving the entire system an almost nature- inspired, pebble-like look. 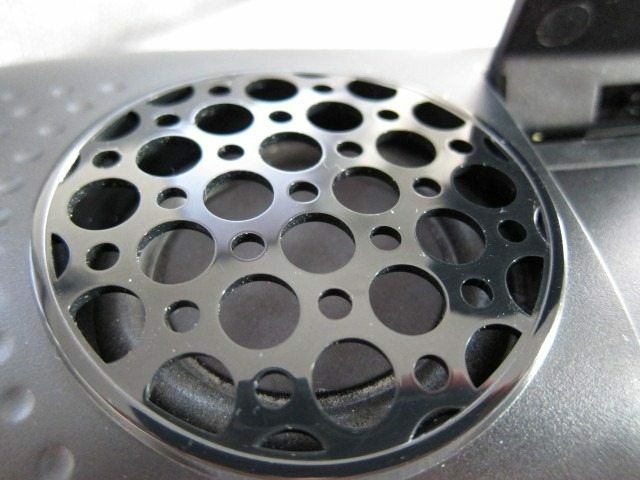 The entire casing seems to have been designed to showcase and accentuate the large speaker grille and drivers. Add the fact that there are metallic accents around the drivers and the way the entire system is slightly angled upwards, the focus clearly seems to be on showing of the drivers. Because of its thin, tapered design there isn’t an area where it can rest on, making the stand an essential part of the design. 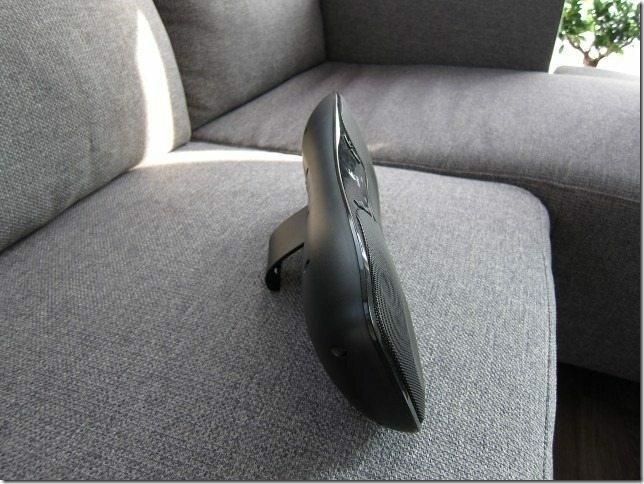 In typical Logitech fashion, build quality is top-notch, without a single single flex in the material or unwanted squeaks. The use of a metal grille, high quality plastics and the extremely small gaps between the various surfaces add to the overall quality feel of the product. 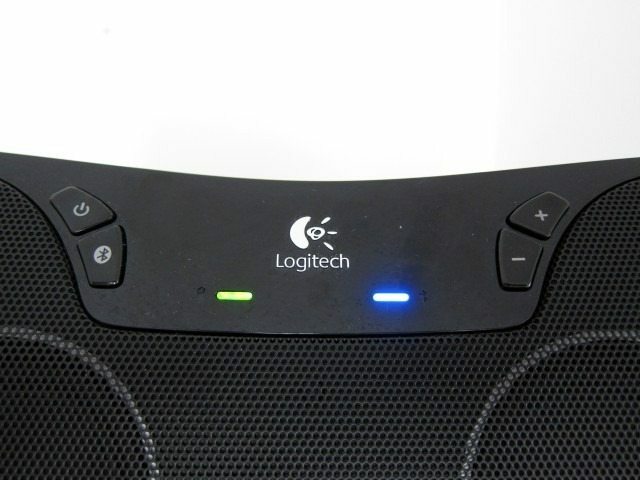 The front is dominated by the speaker grille that covers almost the entire front, except for a small glossy area that houses the Logitech logo, status lights and controls. There appears to be 4 drivers in front, but a closer look reveals that it’s actually two large 3” drivers and two passive radiators. There are also two 0.5” tweeters placed right above each 3” driver. 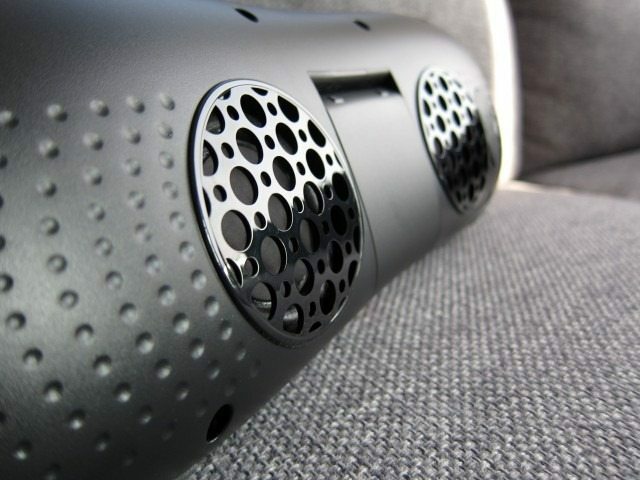 I like the look of the oversized metal speaker grille, which tends to give the system a finished, smooth, organic feel. 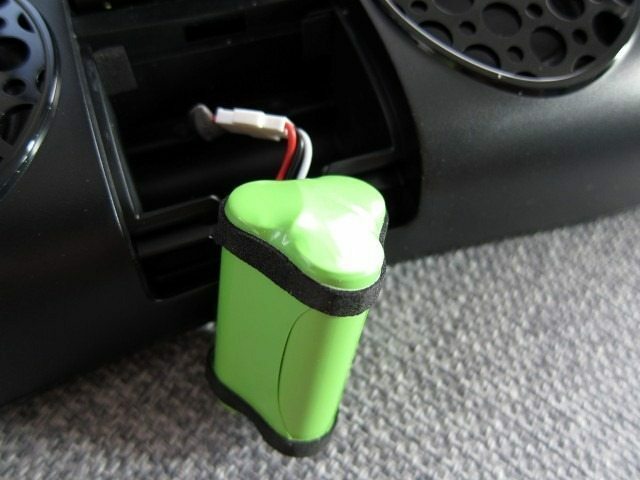 It also has the added plus of protecting both the drivers and passive radiators. 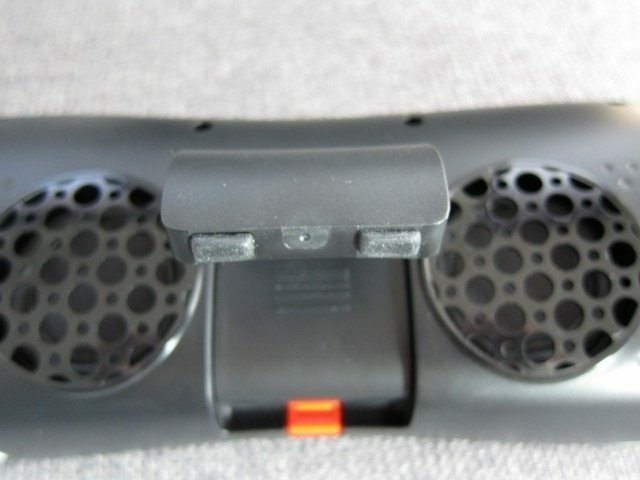 Every material is done in Black, except for the metal accents around the edges of the drivers, radiators and tweeters. 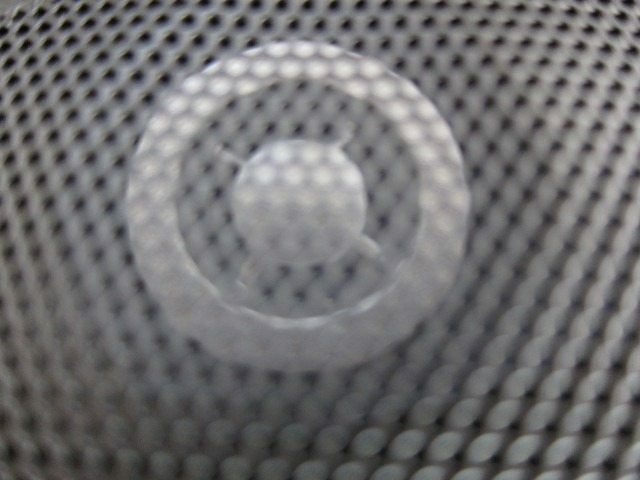 From afar it looks like 6 white circles painted on a Black speaker. It’s only upon closer inspection are there true nature revealed. One neat details is that the rounded grille is actually flattens right above each individual drivers, radiators and tweeters. As expected from almost every modern gadget, the center front area is made of a glossy Black plastic and houses the power button, Bluetooth button, volume up/down, power status and Bluetooth status light. 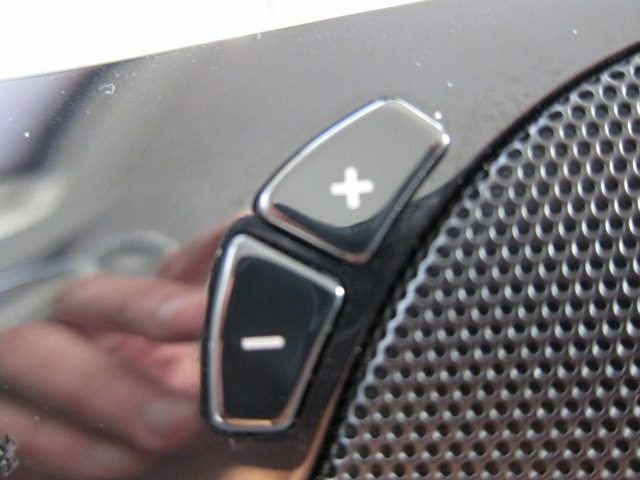 While the modern back-lit capacitive buttons found on the Mini Boombox look cool and modern, nothing beats the traditional buttons, like the ones used on this system. They’re solid, are slightly concaved and give a nice audible click when pressed. 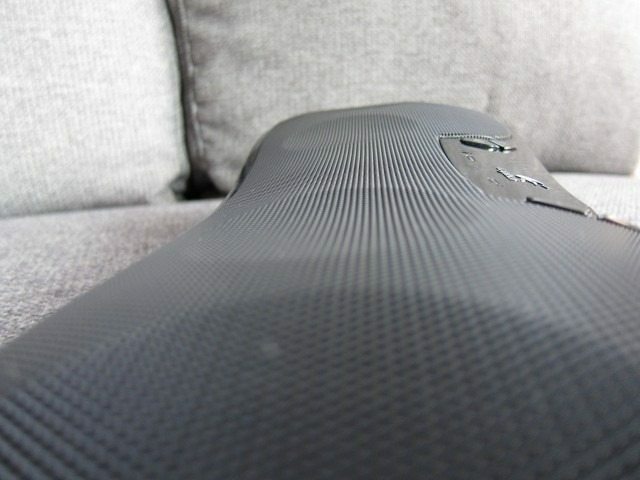 The back continues the all-Black theme, with a smooth, slightly textured plastic finish. 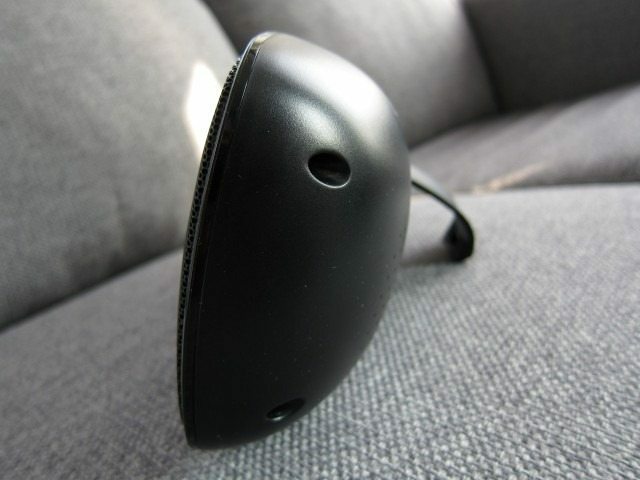 When seen from the back, the curvy peanut shape is even more evident. Like the front, it’s all about flowing lines, giving it almost the look of two pebbles molded together. In the middle there’s an integrated stand that with the press of button quickly pops into place. Without this stand the speaker simply isn’t able to stay upright and in that case can only lay flat facing up. Luckily the stand’s hinge mechanism seems very sturdy and isn’t something that could easily breaks. When needed it pops back into place and nicely integrates with the rest of the body. Next to the stands there are the two remaining passive radiators sitting behind plastic grilles. The area immediately next to the grilles is dimpled, simulating the rounded openings in the grille. Behind the stand there’s cover for the removable battery. 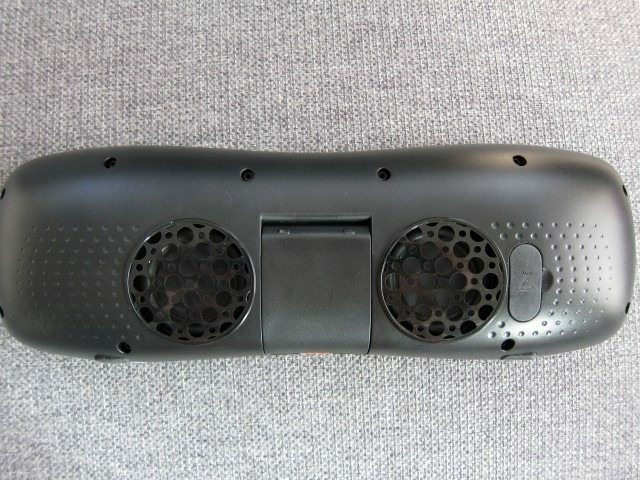 It’s seems to be a custom solution made by Logitech and basically looks like three AA batteries stuck together. 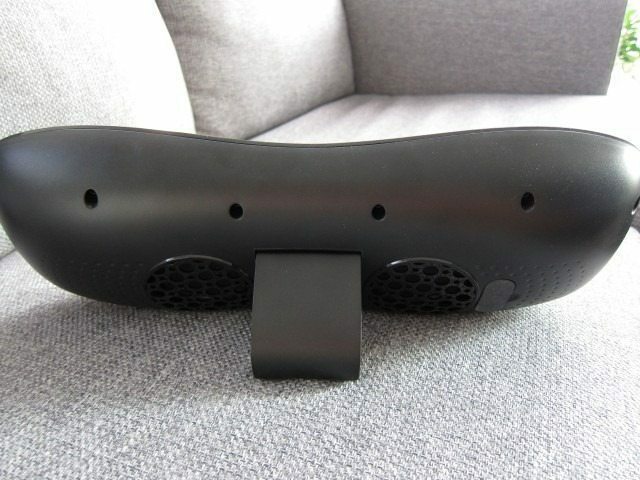 It’s not something you can find in store and you’ll probably need to contact Logitech’s support to get your hand on a replacement, but luckily it it’s easily removed and replaced. Over time these batteries will lose their capacity to hold a charge and having the ability easily replace the battery is an important feature. 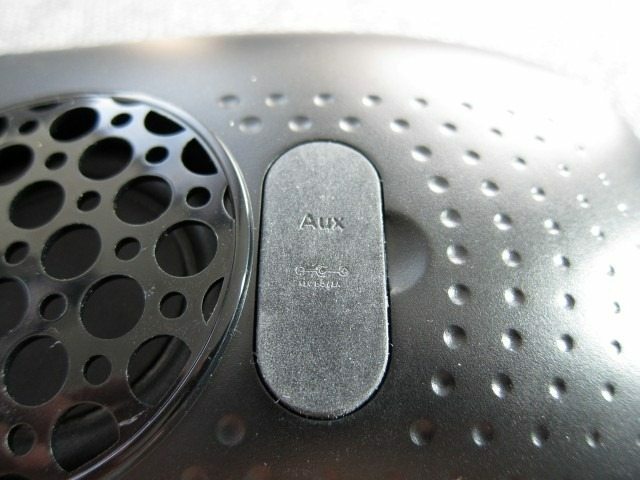 Lastly, there’s the AC power input and the Aux 3.5mm audio input, which can be covered by a thick rubber cover. 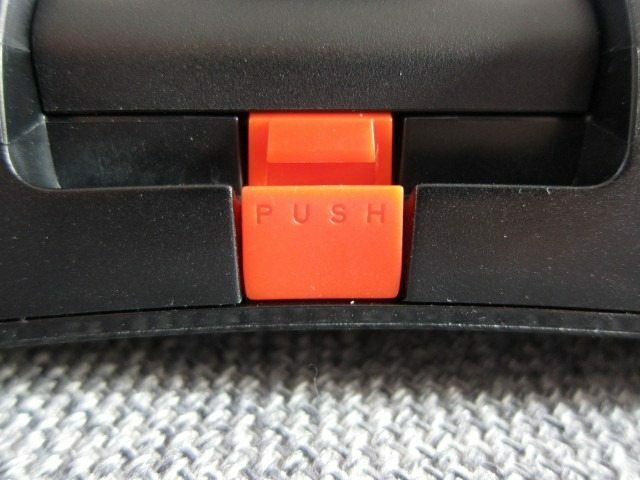 A noteworthy design element Orange button used to open the stand. 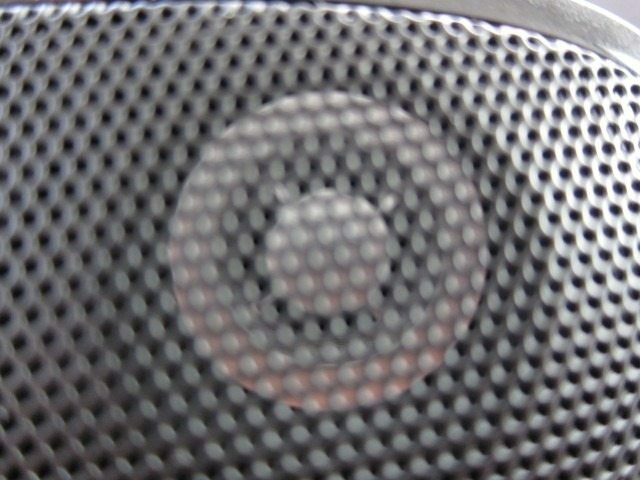 For an all-Black speaker, a bright Orange button seems to be an odd choice for those unfamiliar with Logitech. But if you’ve used their products before you’d know that they seem to have a thing for Orange. From time to time, they tend to create an accessory that has some part or button that’s colored in Bright Orange. In this case the bright color does help you find the stand release button, which admittedly is a bit hidden. When you first turn on the Wireless Boombox it automatically enters pairing mode, with the Bluetooth status light slowly flashing Blue. I was quickly able to pair it to my Galaxy Note without any trouble as the pairing process is similar to other Bluetooth devices. It was also quite easy to connect to my Sony VAIO Z laptop, but just be aware the Boombox is clearly not one of those “smart” Bluetooth devices: it’s not able to connect to multiple devices at the same and only able to stream from one device at a time. However it does remember up to 8 devices in its memory. I also noticed that it doesn’t notify you when it loses the Bluetooth signal. 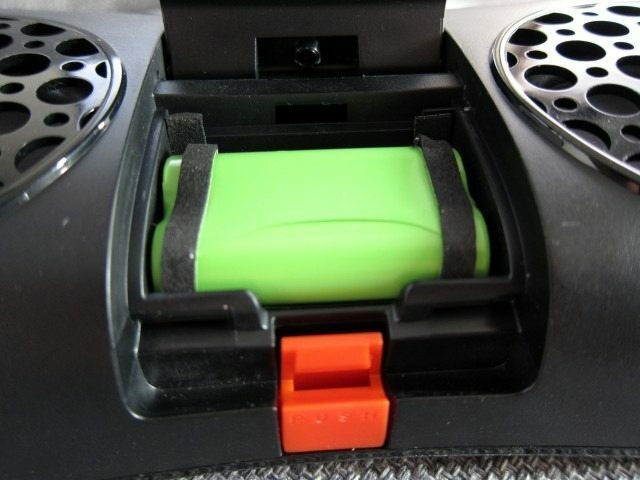 In contrast, the Mini Boombox does give you an audible beep and unlike the Mini, when it loses the connection, it doesn’t actively try to reconnect, but leaves this up to the audio source to re-establish the connection. 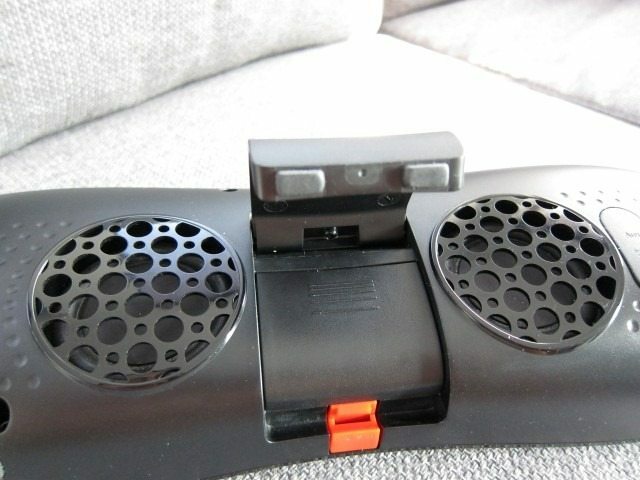 Also missing are audio controls like Play, Pause, Forward and Rewind, features we did find on the cheaper Mini Boombox. This speaker easily makes up for the lack of the more advanced Bluetooth features with its excellent Bluetooth performance. It’s probably the best I’ve seen so far and is right up there with devices such as the Nokia BH-905. 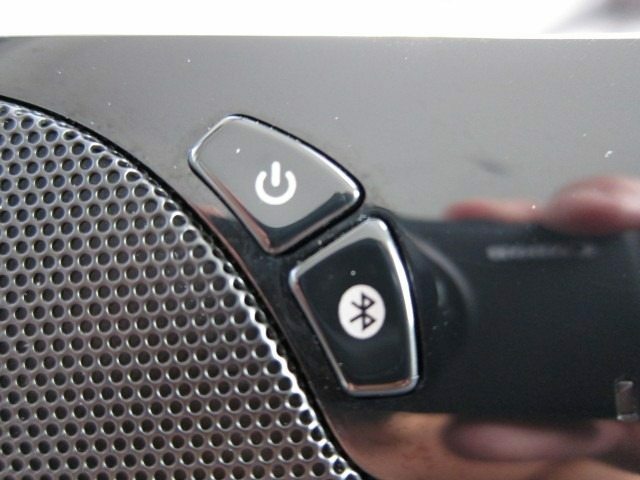 It’s able to maintain a stable Bluetooth connection in conditions where Wi-Fi-based AirPlay or Bluetooth devices tend to struggle. Take for example the long hallway in my apartment notorious for its ability to effect wireless connections. The Boombox was left in the kitchen while I took my smartphone to the end of the corridor. Most devices tend to disconnect at half way through, but to my surprise the Boombox kept playing and didn’t even skip a beat. If you want great Bluetooth performance, this it. It may not have all the controls or be categorized as a “smart” Bluetooth devices, but it performs exceptionally when it comes to Bluetooth connectivity. Even more impressive is its audio performance, but there’s one catch: It all depends on whether you’re powering the unit through its internal battery or directly connected to an outlet via it’s AC adapter. Basically, when running on its battery the unit has exactly 6 watts (2x3W) of power at its disposal. However, connect it to an outlet and its power jumps to a total of 20 watts (2x10w), a significant jump in power which also translates into a substantial jump in performance. The difference isn’t something that has to be measured with audio equipment, but can be clearly heard by even the most inexperienced listener. The extra power also allows the system to play at higher levels, which is confirmed by the maximum Sound Pressure Level (SPL) ratings: when running on battery it’s rated at 82dBC, but when using the A/C adapter it rises to >88dBC. The ability to dynamically adjust of the unit’s power usage and performance depending on the power source is a very smart method to extend battery life. However, sometimes I just wish there was a way to override this system and have the ability to manually select the level of performance. Obviously, these speakers sound better when using the AC adapter, but what if I wanted to enjoy the highest level of performance while the speakers are running on the internal battery? The way the system currently works, there’s simply no way to accomplish this. Understandably, being able to do this would use more power and significantly reduce the 6 hours of battery life, but that’s a sacrifice that should be made in favor of extra control. Logitech should add a button to override the current settings and allow the user to get maximum performance even while on the move. The Wireless Boombox is capable of playing at very high volumes and should easily fill large living room with plenty of sound. Aided by four 2” radiators and obviously the result of using those fairly large 3” drivers, the Boombox is able to dig surprisingly deep and convincingly produce those lower frequencies, impressive for a portable device. It obviously can’t go as deep as a dedicated subwoofer, but it does go deep enough and with enough forcee to create a solid foundation. I was impressed. The use of passive radiators means that you’re getting enhanced bass, but in this case at the cost of it being slightly vague and not quite as responsive as active drivers. The mids were faithfully reproduced and were overall detailed, produced without any effort even in complex passages and at loud volumes. The more difficult-to-produce male voices lacked a bit of mid-bass and sometimes sounded a bit recessed, but nothing that will ruin the listening experience or take away from what overall can be described as close to excellent. The two tweeters did an amazingly great job and can be described as rich, detailed and well integrated with the mids and without making the entire presentation sound bright. In songs with a lot of high frequencies you’re well aware of the prowess of those little tweeters, but there was never the tendency to overpower the mids. The tweeters scored a perfect 10. The system is capable of creating an extremely wide sound stage that hits you with force and gives the illusion of coming from much larger speaker. 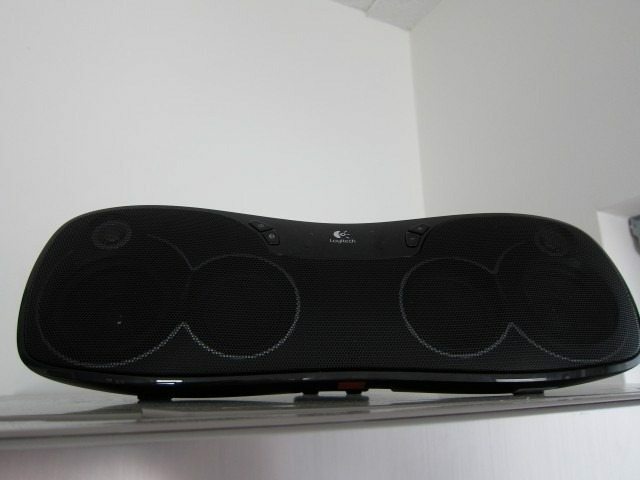 As result, you’re more likely to look past the Wireless Boombox while looking for larger speakers. The Wireless Boombox is able to do this without much effort at up to about 95% of the volume. If you go any higher not only does it become unbearably loud, but the system seems to reach its limit and begins to distort a bit, but this is expected from such compact speakers playing at those high volumes. You’ll need to significantly step up in price to get something this compact that can play at those volumes without distorting. I was interested in seeing if there was a noticeable difference in audio performance between Bluetooth and the auxiliary audio input. Surprisingly, Bluetooth audio sounded overall a tiny bit better and was overall noticeably louder. Using the included cable, the audio had noticeably less volume, less hiss, but was comparable to Bluetooth audio. 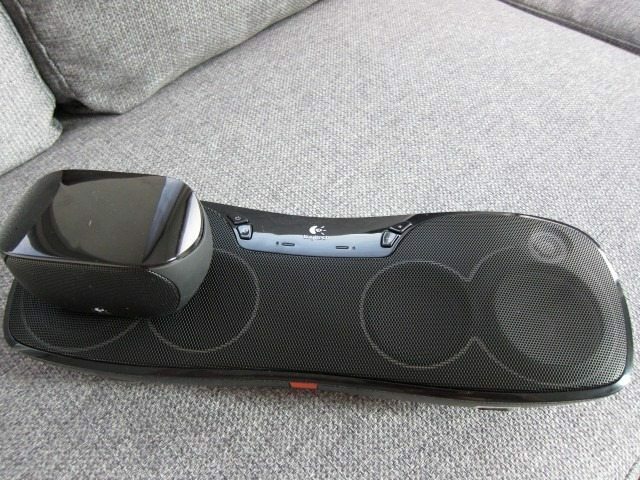 Logitech has done a great job in closing the gap between on the Wireless Boombox when Bluetooth is concerned. There’s absolutely no reason to choose the wired connection above Bluetooth unless you really have to. Overall, there isn’t anything negative to be said about the audio performance unless you’re really nitpicking. The Wireless Boombox’s performance is close to excellent and brings the big sound of AirPlay speaker at a fraction of the cost. 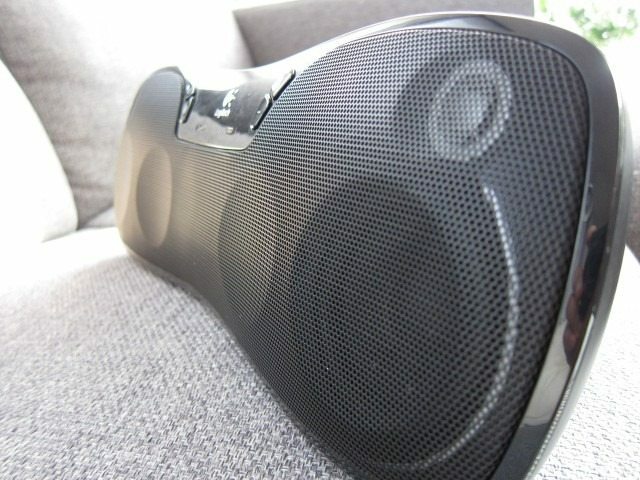 The Wireless Boombox is a speaker with a rechargeable battery and uses Bluetooth as the means to connect to various audio sources. 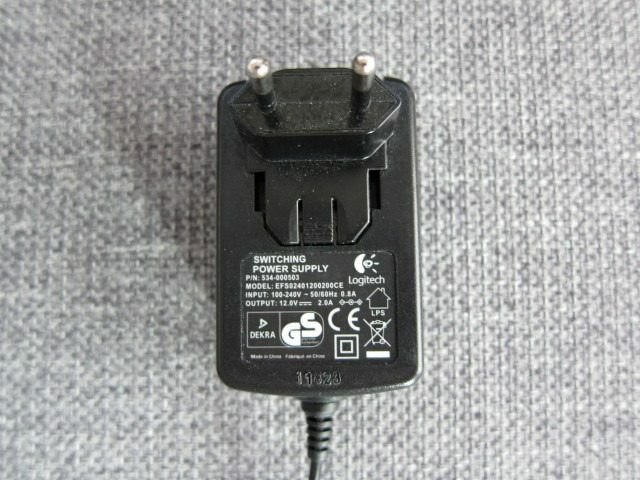 It also allow for wired connections using an auxiliary 3.5mm audio input. It sacrifices portability due to its larger size, but unlike much smaller and more portable speakers, its added size makes room for much larger drivers and a more powerful amp which in turn results in a bigger sound which in combination which Bluetooth allows it to compete with the more expensive AirPlay speakers. And at less than $150 it’s a solid alternative to more expensive AirPlay alternative which can cost as much as 5 times more.. Even more impressive is its audio performance. Aided by four 2” radiators and obviously the result of using those fairly large 3” blow almost all portable speakers out of the water and offers a performance that comes close to and in some cases even rivals many AirPlay-based competitors, making it an extremely good value. While it lacks many smart Bluetooth functions and controls like Play, Pause, Forward and Rewind, features we did find on the cheaper Mini Boombox, it easily makes up for this with excellent Bluetooth performance. In fact, it was difficult to distinguish the audio quality between the wired and wireless connections. 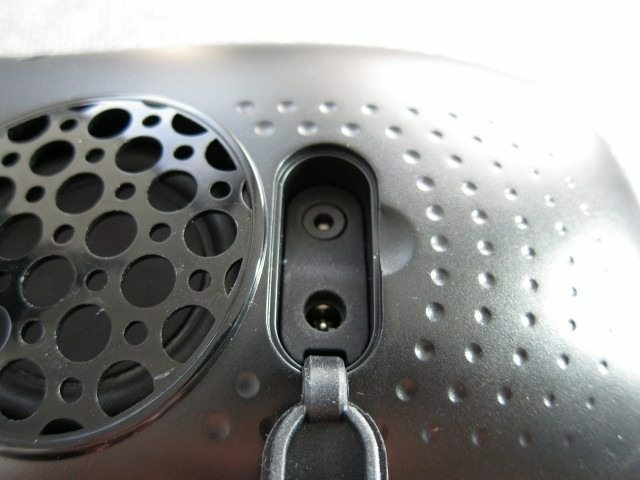 In typical Logitech fashion, there isn’t much to complain about when it comes to build quality. We do however wish they’d include travel case, like with the S715i and wish there was a way manually get best performance when using internal battery. The way the system currently is setup, the only way to get the most performance out of the system is by using the AC adapter. For those looking for serious sound in a portable system, we highly recommend the Logitech Wireless Boombox, which gets a solid 9.8 out of 10. 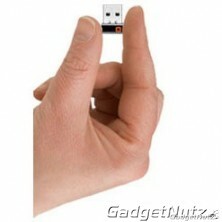 -Pop-up stand integrates into the body for storage. -Smart adjustment of power dependent on the power source. -Good build quality and modern understated design. 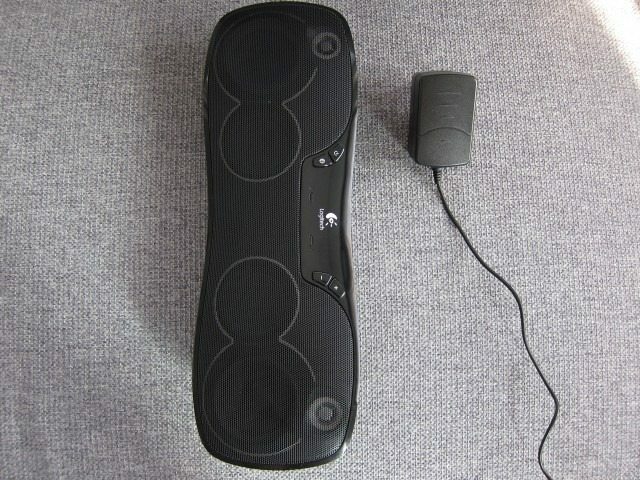 -Unlike the the Rechargeable Speaker S715i, it doesn’t come with travel case. -Not a “smart” Bluetooth devices: can’t connect to several sources at one, re-establish connection or give audible beep when connection is lost.